Weatherproof steel post box with keyed lock from Brabantia, in a contemporary black design. Easy removal of contents via side hinged door. 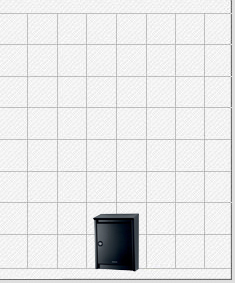 Brabantia	The Brabantia B110 Black Post Box is constructed from high quality pre-coated steel ensuring durable protection and resistance against extreme weather conditions. The top loading letter slot is suitable for A4 mail and is fitted with a protective flap to resist rain. The Brabantia B110 Black Post Box also includes a fixing kit and pre-drilled holes in the rear making it suitable for wall mounting.